Ok, almost. Technically it’s the last day of January as I write this, but I’m ready for January to be done. I don’t know about you, but January took a toll on me and I’m ready for February. Prepping February journal prompts has been so much fun. Some months it’s a challenge to come up with prompts, but February is filled with so much love, which our world really needs right now. 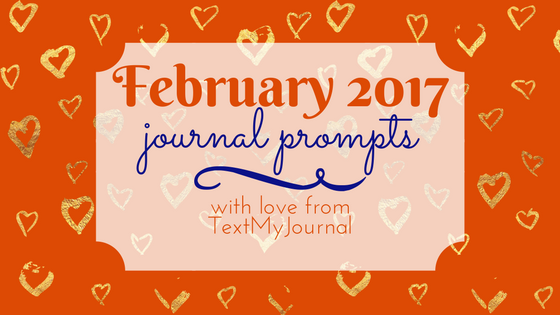 There’s so much hatred, distrust, and fear that it was healing to create the journal prompts for February. So, my challenge to you this month is this: Spread love. Spread lots of it. Spread kindness, spread joy, spread happiness, and love everyone you come in contact with. I hope these journal prompts encourage you to find more love and tolerance within yourself. Remember, everyone has a different story. Our goal is to help people TELL those stories. So tell your story. Really listen to someone else’s. And have a marvelous February. Write one goal for February. List three steps towards accomplishing it. Write about January. What went well? What didn’t? What’s your favorite thing about 2017 so far? Write about a time you overcame a challenge. What secret or vulnerable moment do you keep? Write a mantra for the week. How has the current political environment changed you personally? 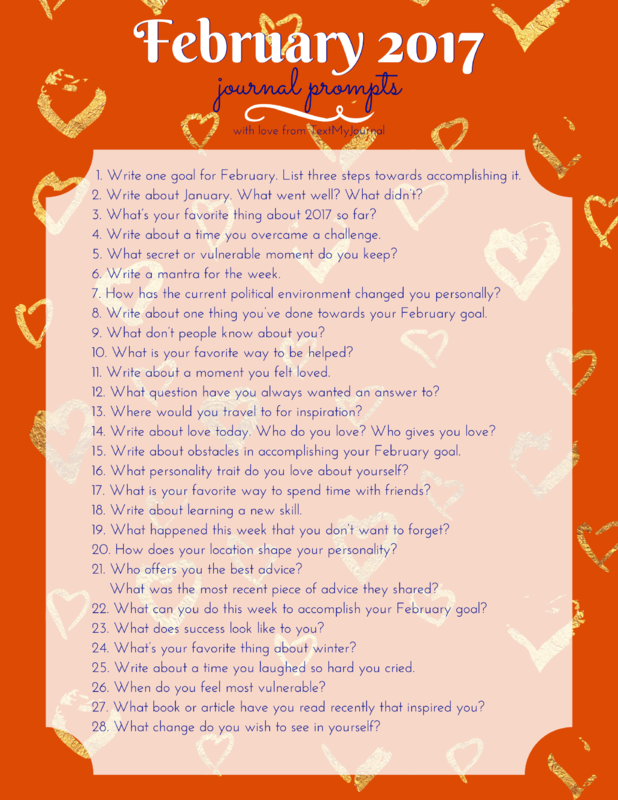 Write about one thing you’ve done towards your February goal. What is your favorite way to be helped? Write about a moment you felt loved. What question have you always wanted an answer to? Where would you travel to for inspiration? Write about love today. Who do you love? Who gives you love? Write about obstacles in accomplishing your February goal. What personality trait do you love about yourself? What is your favorite way to spend time with friends? Write about learning a new skill. What happened this week that you don’t want to forget? How does your location shape your personality? Who offers you the best advice? What was the most recent piece of advice they shared? What can you do this week to accomplish your February goal? Write about a time you laughed so hard you cried. What book or article have you read recently that inspired you? What change do you wish to see in yourself?